As usual, during monsoon, as soon as rain starts, flooding starts in at least 20 districts in Assam in its Brahmaputra Valley. Netizens from Assam starts flooding Twitter/Facebook complaining center or mainland India of ignoring flood in Assam. Also, they keep demanding solving flood problems permanently. Very good and noble demand indeed. And as the death toll in the flood rises, Central Govt normally sends few of its ministers for aerial survey and announce some fund being released for flood relief work. Then rain stops, flood stops, all quiet down. Netizens get back to other issues. This year, I somehow got irritated with this yearly drama, so I thought I should try to Google what is this flood all about. And I am reasonably convinced now that, flood in Assam can not solved without big dams for water resourvior in Arunachal Pradesh or River Linking projects where rivers in India would be interconnected. 1. The width of Brahmaputra valley is average 80KM. Its less in upper Assam than lower Assam. The length of Brahmapura River is approx 600KM from Sadia to Dhubri. 2. Brahmaputra river occupies approx 5KM through out the vallye in the middle, as can be seen in the map. The breadth of Brahmaputra in upper Assam is more, its like 12-15KM and at places, it would be 20KM. Also, after 1950 earth quake, its depth has gone down. 3. 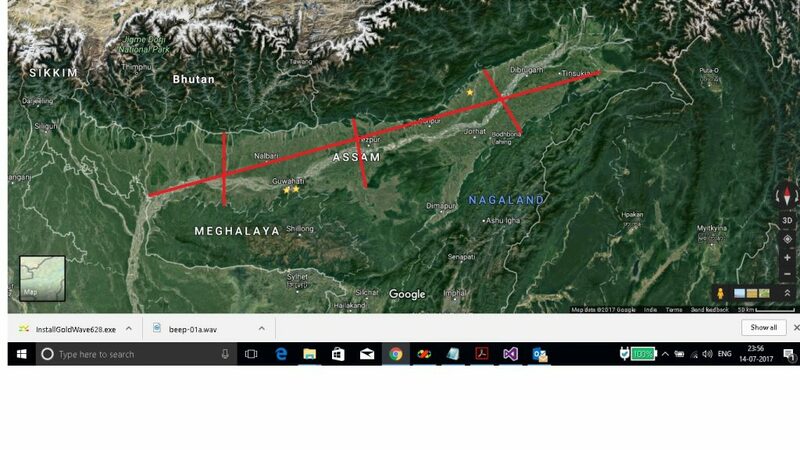 If one observes the map, one would notice that, Brahmaputra valley is like a huge drain, hills on the both sides. 4. The Brahmaputra has more than 120 big/small tributaries. Some are really big like Subansiri, which supplies almost 10% of water to Brahmapura alone. Some are small. Some rivers flow only when it rains in Arunachal Pradesh, Bhutan or Nagaland, KArbi hills. Source. 5. Rainfall in Assam per year is approx 2800mm and Arunachal Pradesh has 2700mm. While Nagaland, another river contributory to Brahmaputra valley gets 1800 while Meghalaya gets 2800mm a year. All these states are at the top of rainfall averages among states in Assam, only Andaman And Nicobar gets more rain then these tiny states. Source. I actually dont need source, I can guess, it really rains a lot in Assam and Arunachal Pradesh. With this kind of climate and geography, I am pretty sure, flood in Assam can not be solved, no matter how much Assamese netizens tweet. According to me, huge investment of money is needed ( either to build safe big dams or water resourvior), and most probably government simply can not afford to do that or simply can not prioritise such huge investment for some 3% of India’s population and 14 LokSabha, 6 Rajya Sabha seats. On top of it, Assam and whole of North East India falls under Seismic Zone V, highest earthquake probability.Also, Assam gets few earth quakes every year. With this kind of scenario, I do not think it is reasonable to expect any solution to flood in Assam. Best way is to live with flood. Like Misis people do. Personally, I have met many Mising from Jiadhal, Dhemaji district Assam, ( I have been there many times as many of my relatives live there) whom I asked about flood in Jiadhal. They have been living with flood for long time, never thought of shifting to other places. When I asked them reason, they told that, rice production is good after flood recedes, fish becomes easily available. Life is good. They live in ‘taleng ukum’ or Changghor, raised houses, so nromaly their houses dont go under water even if water sises 10 feet. And water level rises when it rains continuously for 2 days or more, so they become careful after one days of incessant rain. They seem to have have cracked the way of living with flood and they seem happy. Most probably, living with flood Mising way is the best option for time being for the people of Brahmaputra Valley.